Ah, the mystery of life! 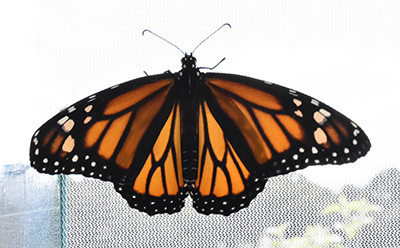 Especially the mysterious life cycle of the Monarch Butterfly. 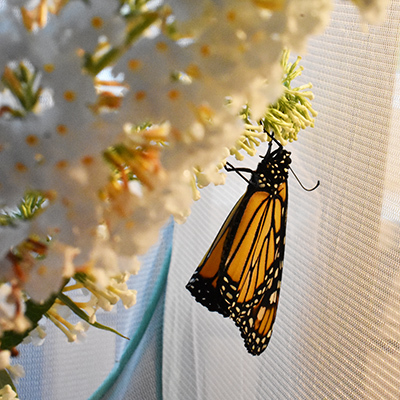 Our good neighbors, Mike & Lida, have been busy raising Monarchs all summer and we were invited to be foster parents to a bunch of caterpillars. 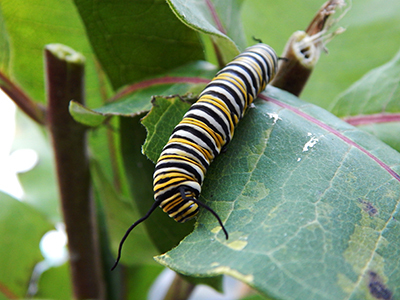 The Monarch caterpillar is a very picky eater. They only dine on milkweed. There are many varieties of milkweed, like Whorled, Common and Swamp, and the plants like to grow in open meadows and on the margins of woods. But these are also the places that are heavily subjected to herbicides, and so there’s a severe decline in wild milkweed and hence the butterflies. 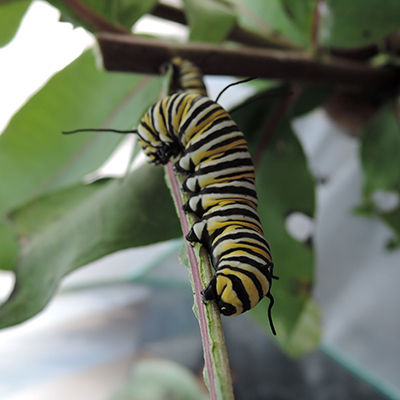 Where goeth the milkweed, so goeth the Monarch. No milkweed, no Monarch. 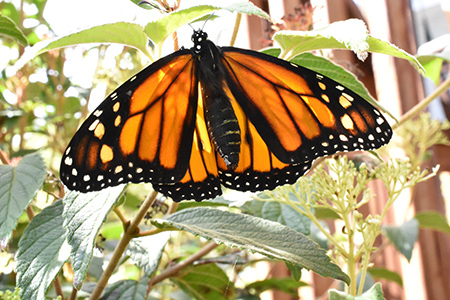 In order to save the butterflies our neighbors have dedicated countless hours to propagating and planting milkweed. 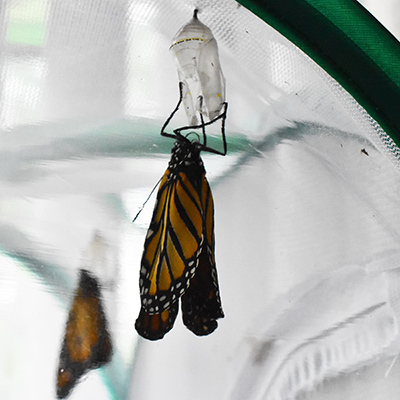 They’ve sowed different varieties all over their farm, collected butterfly eggs from underneath the leaves, hatched caterpillars from the eggs, and safe-harbored hundreds of butterflies from chrysalis to flight. Their butterflies have been released to the wild to start the cycle all over again. 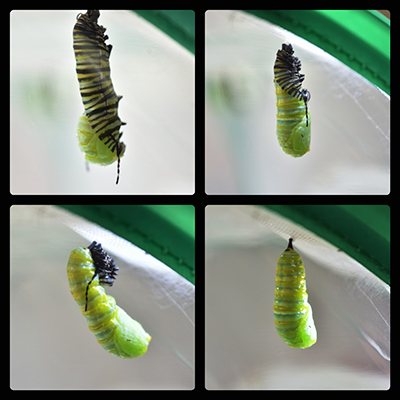 We got to participate in this life cycle and watch the metamorphosis firsthand. 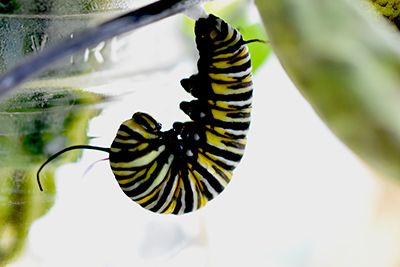 We were given six Monarch caterpillars to raise in a special butterfly cage. The butterfly cage looks like one of those netted laundry hampers you might buy at a dollar store, except that it has a closed top and a zipper on the side. 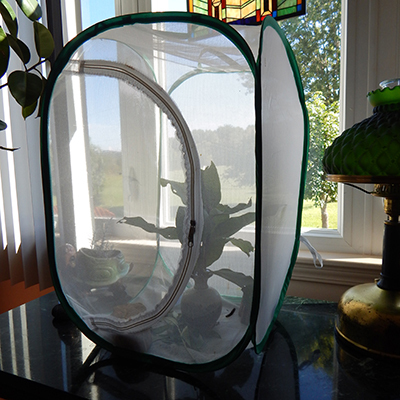 The side zipper is necessary because caterpillars will climb to the top of the cage to hang a chrysalis. 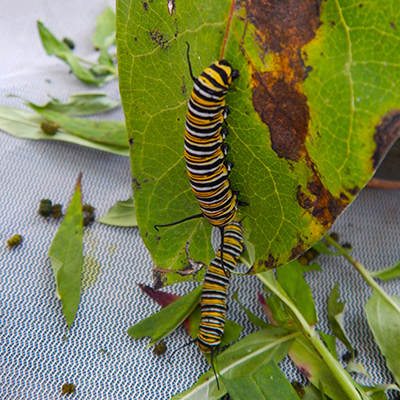 Our six caterpillars spent a few days munching nonstop on milkweed. 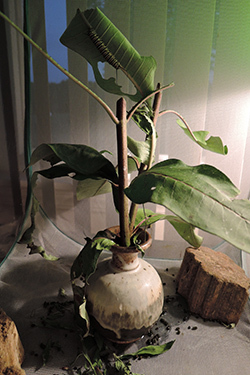 We had sprigs of milkweed stuffed in a vase and the caterpillars ate through that supply in short order. Tim and I looked all around our farm but couldn’t find any milkweed that hadn’t been mowed down, so Lida helped me find some she planted in the remote corners of her property. 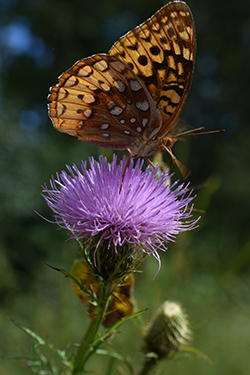 I snapped this picture of a Great Spangled Fritillary butterfly on a thistle while we were hunting milkweed. Not only did the caterpillars devour all the milkweed leaves in our cage in just a of couple days, but they made an incredible amount of poop. Really. Like rabbit pellets. Filled the bottom of the cage. It’s such a startling effect that the poop actually has its own name – Frass. That’s right, frass is bug poop. A great scrabble word, and you learned it here! When the caterpillars get large and fat enough they head for a tall surface, which in this case was the top of the cage. The caterpillars spin a small web of silk from their tail and hang upside down in a J formation. They stay in this upside-down position for a day or two. Then, like taking off a coat, they shed their caterpillar skin. 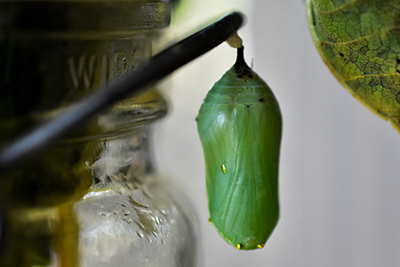 The skin splits open in the back and they wiggle out of their old caterpillar skin – legs, feet, antenna and all – until a shiny green chrysalis is revealed. The whole wiggling out process takes less than a minute, and I spent an entire day hovering around the cage with my camera to capture this fleeting moment of transformation. Let’s think about that process. 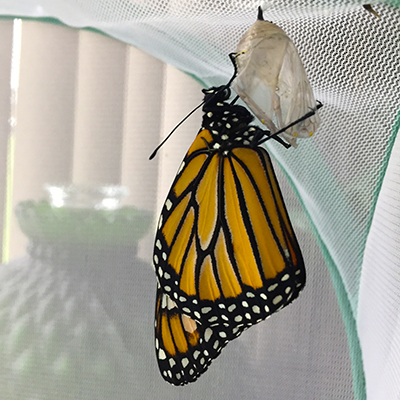 Monarch caterpillars don’t make a cocoon. There’s no silky blanket from which the butterfly emerges. Instead, the chrysalis is inside the caterpillar. They shed off their caterpillar skin and underneath is the animal transformed. Weird, huh? Don’t you wish that sometimes you could shed your old skin and become something entirely shiny and new? The chrysalis hangs for a week or two from its silk thread. 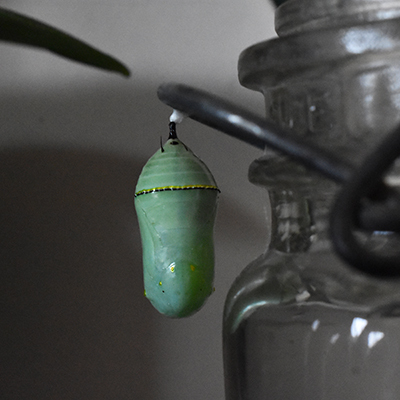 No bigger than your thumb nail, the shiny pale exterior slowly darkens to a deep green as the chrysalis ages. It’s flecked with gold specks and has a bright gold band near the top. Then one day, in an instant a butterfly emerges. Breaking through the thin clear skin of the pod, the fully formed butterfly pops out in a few seconds. It happens so quickly that if you leave the room to go frass you’ll probably miss the moment. Like I did several times. Newly emerged butterflies need to unfold and dry their wings for the better part of a day. They hang from a high perch near the empty shell to flex and flutter. If the drying process is interrupted the wings could be damaged and it will never fly. So straighten up and fly right! Once the wings are dry the transformation is complete and the butterflies are ready to be released outdoors. 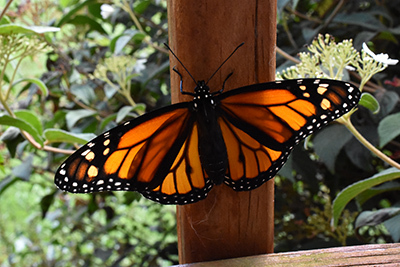 Monarchs can live for a couple of years and many migrate to Mexico to spend the winter. Imagine this tiny thing flying all the way to Mexico! But they do – by the millions. And next summer they’ll find their way back to our farm to lay eggs on some tender milkweed. Amazing. We did a pretty good job as foster parents. Out of the six caterpillars we were given, five butterflies were successfully released to the wild. One puny little caterpillar didn’t make it, probably due to a wasp parasite. Quite common and part of nature’s way. But the other butterflies made a long, soaring first flight to the woods and we happily waved them goodbye. Aren’t they lovely? They’re like stained glass windows in motion. I never metamorphosis I didn’t like! There are different kinds of milkweed! Frass is a word! The chrysalis comes from InsIde the caterpillar! I learned so much; thank you!